Josie Mae Howard, also known as “Jo-Mae,” finished her earthly duties on June 14, 2015, at age 83. She was born on December 20, 1931, in Port Gibson, Mississippi, to Lucille Johnson and Willie Wells. She was a proud devout Christian and served the Lord faithfully. She was compassionate and loving. It was her mission in this life to love, feed, care for, and nurture all people. She began that mission in Jackson, Mississippi where she worked for The Mississippi School of the Blind caring and preparing meals for the students. She continued that work when she moved to Santa Barbara, California in 1979 and worked for the Peterkins Nursing and Convalescent Homes for 30 years. Even though she had a big, loving heart for everyone, it was her family and her children she loved the most. In 1951 she married Charles H. Howard, Sr. (deceased). Together they built a strong and proud southern family. To all that knew her, you know that she spoke proudly about her fourteen (14) children: Willie E. Wells, Herman L. Howard, Charles H. Howard, Jr. (deceased), Earnest E. Howard, Janice R. Hart, Randy E. Howard, Ronald D. Howard, Samuel R. Howard, Jesse E. Howard, David S. Howard, Donald R. Howard, Donna K. Jackson, Jerry J. Howard, and Rashunda M. Howard. 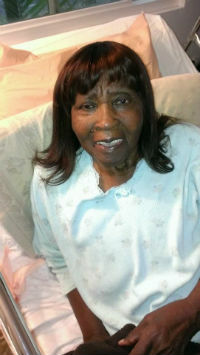 She is also survived by her sister and brother-in-law Betty and Frank Hughes, her brother and sister-in-law Arthur Yvonne McNair, Jr., her best friend and cousin Mary Lee Griffin (also known as “Momma Honey”), 39 grandchildren, 47 great grandchildren, and many cousins, nieces, nephews, and friends. She was a strong and loving mother who will be missed very much. Visitation will be held on Thursday, June 25, 2015, from 4:00p.m. to 6:00p.m. at Greater Hope Missionary Baptist Church located at 430 E. Figueroa Street, Santa Barbara, CA 93101. Funeral services will be celebrated at 11:00a.m. on Friday, June 26, 2015, at Greater Hope with Reverend J.B. Ficklin officiating. Interment to follow at Santa Barbara Cemetery 901 Channel drive in Santa Barbara, CA. Flowers may be delivered to the church. To sign the family’s on line guestbook, share stories, and post pictures please visit our website:www.garciamortuaryoxnard.com and click on Josie’s name located below “Obituaries.” Funeral arrangements are under the direction of Garcia Mortuary, 629 South A Street, Oxnard. For further information, please call (805) 486-9148.